Paul Vermaas is a nautical surveyor and also managing director of Vermaas Marine. During his study and after graduating on the nautical college at Flushing he served on various types of ships of the Dutch merchant navy during a period of nearly ten years, where after he became a nautical surveyor. After having passed the examination as Master Mariner, Paul followed various maritime studies and insurance courses. As a result of his experience at sea and more than 25 years of experience as nautical surveyor - more than 15 years of which in his own firm- he is an all-round nautical expert. 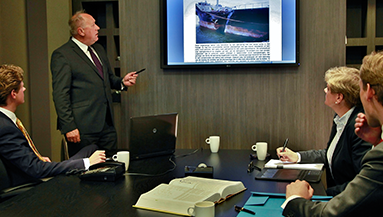 He is appointed as an expert in many nautical disputes, mediations and court proceedings within and outside Europe. Further to his capacity as surveyor he gives lectureships to insurers and ship owners on risk management. Tom Vermaas is chemical consultant and surveyor at Vermaas Marine. He obtained his Master of Science degree in chemistry after his study at the Universiteit van Leiden and University of Oxford. As a result of his scientific experience Tom is able to conduct problem solving research. To this effect he analyses the crucial details of cargo damages, disputes and claims in order to establish the areas where laboratory study is required. Tom is specialised in structuring testing schemes on samples taken from edible oils and fats, mineral oils, petrochemicals, etc. The combination of literature study, field research and contacts within universities ensures an effective analysis of the relevant facts and findings. By means of this working practice Tom is able to give conclusive advice in complex matters, such as the discoloration of phenol, coating damages, etc. Marian van Houwelingen is office manager at Vermaas Marine. After graduating for Assurantie B. Marian worked for ten years as insurance advisor in the private and business sector. Marian serves as office manager with Vermaas Marine since 2009. Her tasks include the registration of new matters, keeping accounts and optimisation of the communication with our principals. Laurens Vermaas studied organic chemistry at the Avans university of Applied sciences in Breda. He is specialised in the chemistry of the food sector. He conducted research at various innovation centres; at the market leader of natural food preservation and subsequently at one of the largest vegetable oil refineries of Europe. He became a specialist in the chemistry of vegetable oils and fats by performing product development research. Further to his particular expertise in vegetable oils and fats Laurens handles other cargo damages, disputes and problems where chemical laboratories are needed to establish the extent and true cause. For reasons that safety is highly valued at Vermaas Marine Laurens followed various safety courses. He holds the Basic Elements of Safety Checklist certificate and followed a course fire extinguishing.